This B&W Lithograph was printed by 1st Team Press for the 50th Anniversary of Captain America Celebration at SDCC 1990. There was only 210 made. It is signed and numbered by Jack THE KING Kirby and stamped with the 1st Team Press Seal. It is also hand signed by Stan THE MAN Lee and verified with his hologram COA sticker. 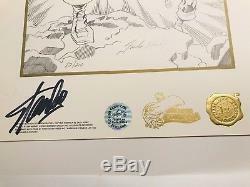 This is a VERY RARE piece signed by both these LEGENDARY creators. Own a piece of comic book history. 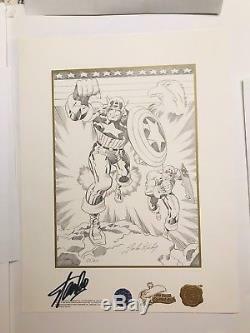 The item "SDCC 1990 CAPTAIN AMERICA 50th Anniversary Stan Lee & Jack Kirby SIGNED withCOA" is in sale since Tuesday, November 13, 2018. This item is in the category "Collectibles\Comics\Original Comic Art\Other Original Comic Art". The seller is "lb_comicfan" and is located in Long Beach, California. This item can be shipped to United States.